Welcome back to the First Monday Library Chat! We’ve been talking to libraries in the USA and Canada, but today we jump across the pond to the British Library in London, England. The British Library is one of the largest libraries in the world, with around 14 million books and a grand total of over 150 million items, print and digital. Today I’m chatting with Dr. Arnold Hunt, Curator of Manuscripts at the British Library, about some of the manuscript recipe books in their collection. The British Library has an impressive assortment of bound manuscript recipe books, and some loose recipe collections. Can you give us an idea of the scope of the library’s holdings? Our subject-index of manuscripts lists over 300 items under the heading ‘Recipes’ or ‘Receipts’, ranging in date from medieval to nineteenth century, but chiefly from the early modern period.Some could be categorized as ‘cookery’ or ‘medicine’, but others are just listed in our catalogue as ‘miscellaneous receipts’ with no clear indication of their contents, so there’s still a lot of work to be done in describing and cataloguing them all properly.This is definitely one of the more neglected areas of our manuscript collections – partly, I suspect, because until recently these manuscripts would have been regarded as women’s work and therefore not very important. I have a particular love for Sir Hans Sloane’s collection of manuscripts, which includes several early modern medical and scientific recipe books. Can you tell us a bit more about why the Sloane collection is important, and when and how the British Library acquired these works? Sloane specialized in medicine and botany, though he collected very widely in other areas as well.For the first half of the eighteenth century, right up to his death in 1753, he was the pre-eminent English collector in these fields, so he had the pick of everything that came onto the market.One reason why his collections are important, though, is that he wasn’t fussy about what he acquired – he just collected everything he could lay his hands on – so his library is full of manuscript recipe books, including a lot of those ‘miscellaneous receipts’ that I mentioned just now, that a more fastidious collector might have discarded.After his death his collections were bought by Parliament and became the foundation of the newly-formed British Museum, later sub-divided to create the National History Museum and the British Library. 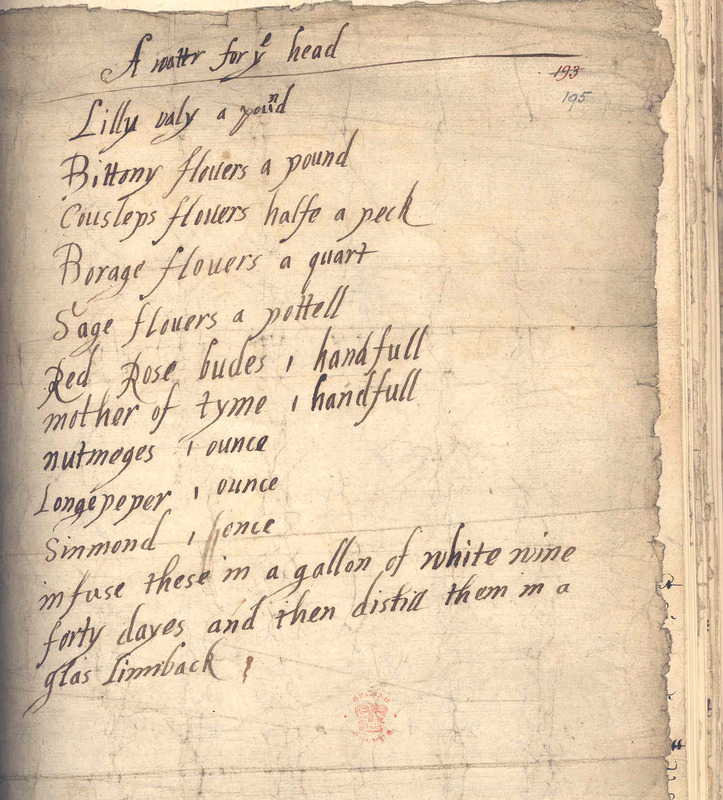 The Sloane collection includes some manuscript recipe books by both well-known and lesser-known figures. Why do you think Sloane was interested in collecting these? How do they fit into his book collection as a whole, or what can they tell us about Sloane? Sloane’s motives for collecting aren’t always clear.But as a good Baconian, he wanted to get rid of the medieval tradition of ‘books of secrets’ and bring science and medicine into the realm of public knowledge.By acquiring these recipe books, he was bringing their contents into the public domain where they could be empirically tested by enlightened physicians like himself.The good recipes could be adopted, the bad ones could be discredited, and medical knowledge would thus be advanced.In other words, he seems to have looked on these manuscripts as potentially valuable resources for his own clinical practice. I’ve noticed that many of the British Library’s recipe books, in the Sloane collection and in others, have been rebound. The new bindings are far less fragile and easier to use, but without the original bindings we lose some clues to the original composition process and use. Can you talk a bit more about conservation decisions? How do modern conservation practices differ from older ones? Many of Sloane’s manuscripts were rebound in the nineteenth century.This was done for what at the time seemed to be perfectly good reasons, but it had some unfortunate results.I particularly regret the loss of some of Sloane’s notes on the flyleaves of his manuscripts, as well as notes by previous owners which might have told us something about their earlier provenance.Conservation nowadays is carried out with a lighter touch, and when manuscripts are rebound we generally preserve the covers of the old binding. Our Collection Care blog explains the reasoning behind some of our conservation decisions. 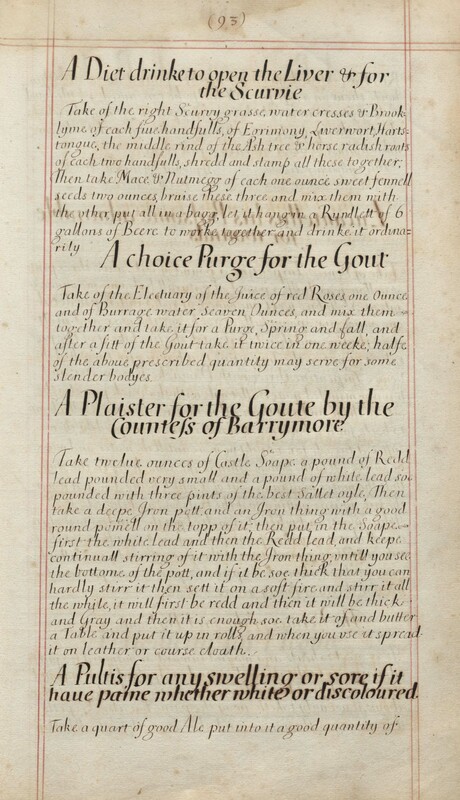 Can you describe a couple of interesting recipe-related manuscripts in the Sloane collection that could inform us a bit about the scope of Sloane’s collecting practices? 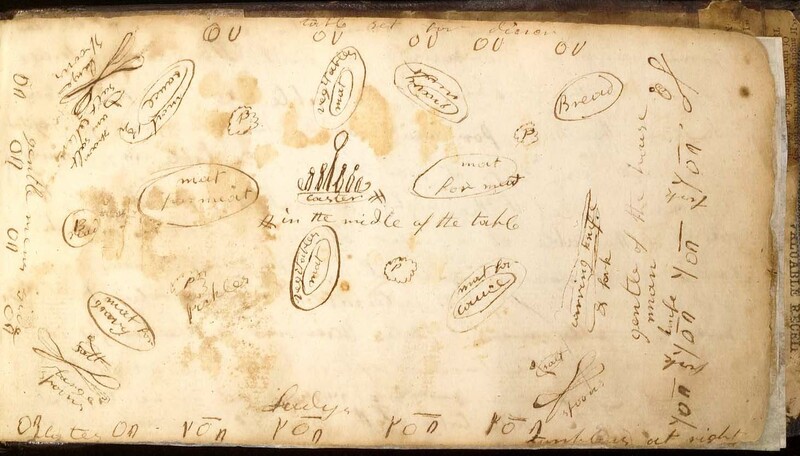 Sloane MS 703 is a volume of household receipts, very neatly copied in a late seventeenth-century hand, which Sloane’s librarian Humfrey Wanley described as ‘A great Collection of Receits in Cookery, Physick, and other matters Relating to Women’. ‘To make Oring Marmelett’. British Library, Sloane MS 703, f. 43v. Sloane MS 1000 is a more miscellaneous collection, copied in a variety of different hands, often on small scraps of paper, which Sloane listed in his catalogue as ‘Processes and receits’ collected by ‘Mr Bonivert’ (i.e. Gideon Bonivert, one of Sloane’s correspondents). ‘A water for the head’. British Library, Sloane MS 1000, f. 195r. What these two manuscripts show is that there’s very little distinction, in the early modern period, between receipts collected for domestic and household use and those collected for professional or medical use.Bonivert’s collection includes examples of both, and Sloane himself collected right across the spectrum. Do these recipe books factor into any institutional digitization priority lists that might eventually provide free access? For many of Sloane’s manuscripts we’re still reliant on eighteenth- and nineteenth-century catalogue descriptions, so at the moment I feel the priority is to get the collection properly catalogued to modern standards.Ideally this would include digitization as well, but the scale of Sloane’s collection makes this a dauntingly large task.However, we’ve been working with the British Museum and the Natural History Museum on a project called Sloane’s Treasures, which has the ultimate aim of bringing together all Sloane’s collections – books and manuscripts, prints and drawings, artifacts and specimens – into a single database where they can be studied as a unified whole. Can anyone visit the collections in the Manuscript Reading Room? Most of our manuscripts are available for consultation by anyone with a BL reader’s pass, though for some manuscripts we ask readers to supply a letter of introduction from an academic colleague or tutor. If you’re planning a visit to the BL, and you already know what you want to see, you can order items in advance. If you have a question about a particular manuscript in our collection, you can contact us at mss@bl.uk. If you would like to suggest a library for the First Monday Library Chat, please contact Michelle DiMeo. Welcome back to the First Monday Library Chat! After last month’s chat with the Winterthur Library in Delaware, we now jump to Edmonton, Alberta, in Canada. Today I’m chatting with Glynys Hohmann, Team Lead in Government Records, and Karen Simonson, Reference Archivist in Access and Preservation Services, at the Provincial Archives of Alberta. 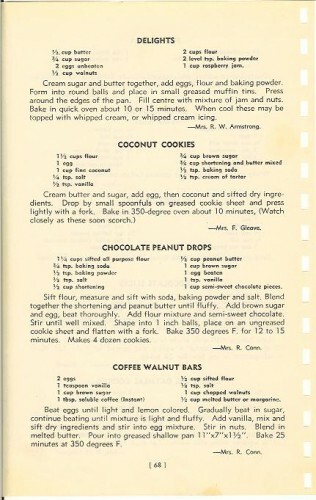 You have several early and mid-twentieth-century recipe books in your collection. Can you tell me a bit more about them? 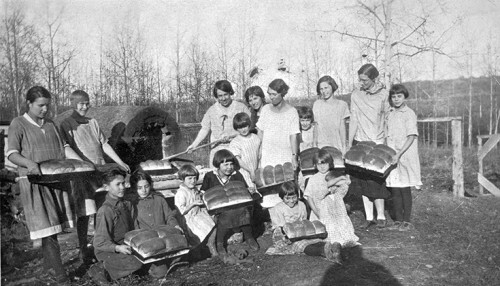 The Provincial Archives of Alberta has recipe books dating from the early to late twentieth-century. 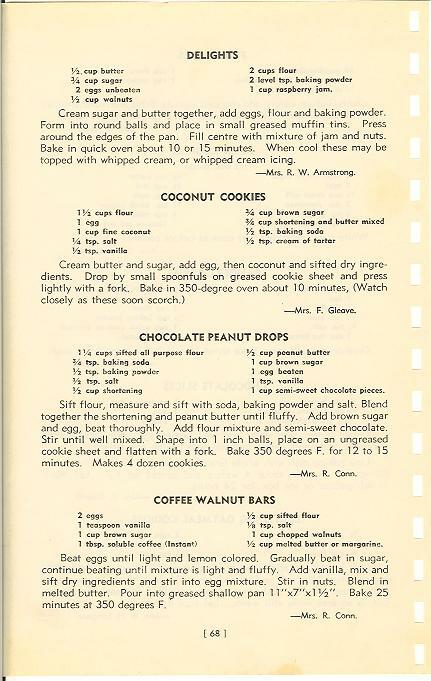 Some of the cookbooks, included in our fonds, were mass produced; others were produced by local organizations and church or women’s groups; and a few of the recipes are handwritten favourites jotted down by the fonds’ creators. (They’re Girls until they are 80. They say). ‘Tis simple, you’re in, if you study this book. Try that concoction on page 68. Other recipes or cookbooks at the Provincial Archives of Alberta are handwritten. In the Cornelia Wood fonds, for instance, there is a notebook of “lessons in cookery” (circa 1912). Written in a scribbler notebook, Cornelia’s recipes included coffee, tea, cereal and cakes, and “general notes” on how to make pastry along with pie fillings, as well as Thanksgiving ideas such as a pumpkin pie recipe. In addition, the Provincial Archives of Alberta houses hundreds of newspapers, on microfilm, from communities both large and small which trace events throughout Alberta’s history. These newspapers often include interesting recipes in their women’s sections. 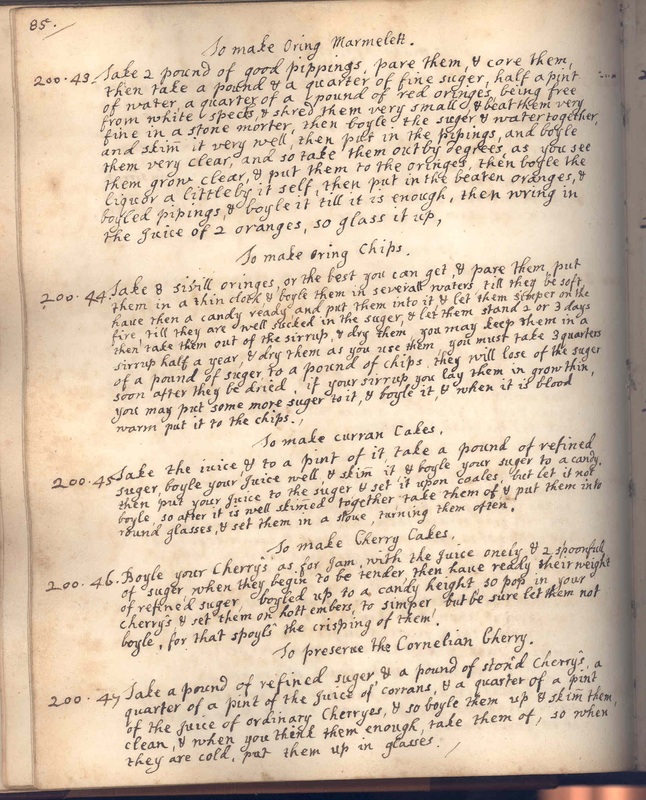 The subtitle of the Recipes Project blog is “Food, Magic, Science and Medicine.” In addition to your recipe books, do you have other archival items that might be of interest to researchers working on these topics? Although the Falun Sunshine Food Club fonds does not include recipes or a cookbook, it demonstrates some thoughts around cookery in the early 1950s. At meetings, the club (organized in 1951) would have demonstrations on making muffins, white sauce, cream soup and other foods, as well as demonstrations on how to set the table. During roll call at each meeting, the members would be asked to state different things relating to food such as “recipes I have collected”, “breakfast and dinner menus” and “your weight compared with what it should be.” The minutes record that only two members had their “ideal” weight, while two were underweight and three were overweight. I love that — ripe with potential for the cultural historian! What other culinary history items can you highlight for me? The Provincial Archives also has records relating to food establishments. Many fonds include menus from restaurants, hotels, and banquets such as a short order menu from the Dawson Creek Grill, a breakfast menu dating to circa 1923 from the Florence Hotel in Killam, Alberta, menus from the Edmonton Journal’s 60th Anniversary Banquet in 1963, and menus from the Canadian Pacific Railway and the Canadian Northern Railway. The Provincial Archives of Alberta is the repository for the records of the Government of Alberta; as such, we also have records relating to the Government’s administration of agriculture and food in the province. The Agriculture, Food and Rural Development fonds dates from 1887-1993 and consists of over 1638 metres of textual records. The Dairy Division, a series within the fonds, has records regarding consumer safety and dairy products. I’m sure most readers of this blog have never been to the Provincial Archives of Alberta. Can you tell us more about your collection as a whole, and what subject strengths you have? The Provincial Archives of Alberta preserves and makes available for research both private and government records of all media related to the history and culture of Alberta, and serves as the permanent archival repository of the Government of Alberta. The Archives ensures a continuity of historical records of Alberta for today and tomorrow, so that the citizens of Alberta can use these records to better understand themselves. Baking bread at Kolokreeka School, Smoky Lake, ca. 1930. How can we access your collections? Do you offer any travel fellowships? How much material is available online? Most records available at the Provincial Archives of Alberta may only be accessed in person; however, holdings may be searched online. In our online collection of images, there are also descriptions of approximately 199 photographs of restaurants. The Provincial Archives does not provide for travel fellowships. Thanks, Glynys and Karen, for chatting with me! Be sure to join us again right after the holidays as we kick off 2014 with an interview with the British Library in London! If you’d like to inquire about featuring a library in this series, feel free to email: Michelle DiMeo. Welcome to our new monthly series! On the first Monday of every month, Michelle DiMeo will be interviewing a library or archive about the recipe books in their collections. 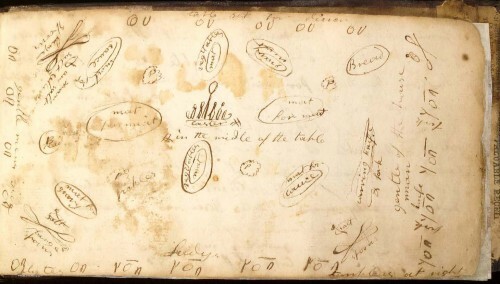 I’ve seen a few scholarly publications make reference to eighteenth- and nineteenth-century manuscript recipe books in your Joseph Downs collection. Can you tell us more about the scope of this collection? It’s difficult to give an exact number of manuscript recipe books in the collection. Individual volumes number around 80, with additional ones and loose recipes housed within larger collections of family papers, and recipes that were written or pasted into account books and scrapbooks. 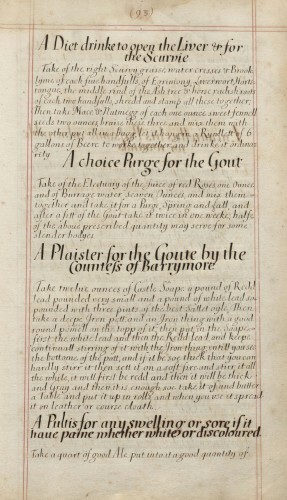 The Shaker manuscript collection includes several recipe books, including two by Nurse Prudence Morrell of the New Lebanon, New York community who compiled medicinal recipes with botanical ingredients, one volume specifically for “female diseases.” Overall, the recipes cover not only cookery, medicine, and personal hygiene but also household hints, laundry, animal care, dyes, pottery glazes, paints and varnishes, and more. The books range in date from 1669 to the early 1900s; however, the majority is from the nineteenth century. Apart from the Joseph Downs collection, do you have other recipe-related items, either ephemera or printed books, that might interest our readers? Is the strength of your recipe book collection American-authored texts? The Printed Book Collection contains more recipe books, including The Compleat Housewife: or, Accomplish’d Gentlewoman’s Companion, the first cookbook printed in America in 1742 by William Parks of Williamsburg, VA, which was a revised edition of Eliza Smith’s 1727 one published in London. Books by famous 19th century English and American authors like Mrs. Beeton, Catharine Beecher, Lydia Maria Child, Sarah Josepha Hale, Eliza Leslie, and Maria Eliza Ketelby Rundell are also here. In addition, that collection has numerous printed trade catalogs for foods and beverages; many are available through the Internet Archive. 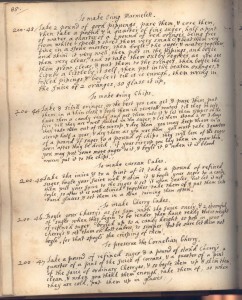 Most manuscript recipe books are American, primarily from New England and Mid-Atlantic states, with several from England. Related material for food and beverages is found in several ephemera collections of advertisements, trade cards, and bills. Do you have a favorite item or two in your library that you can highlight for us? Choosing favorites is always problematic, but two are standouts for different reasons. 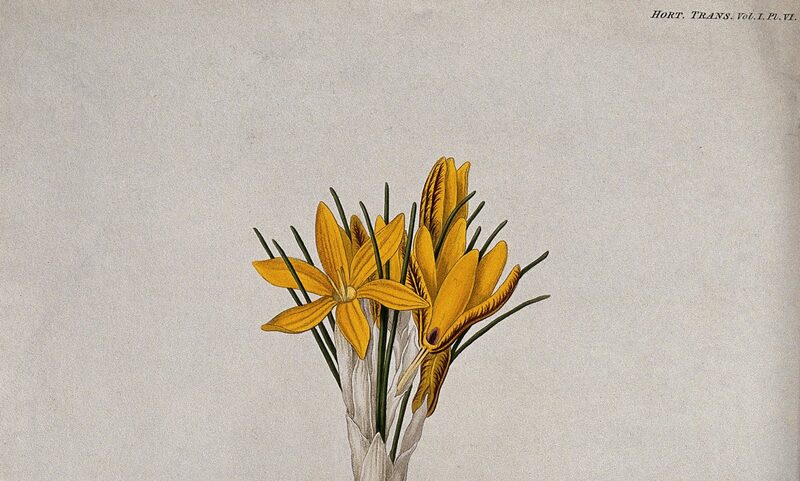 For pure aesthetics, the first is the collection’s earliest recipe book from England dating around 1669. Its gorgeous red morocco leather binding features the owner’s initials, A.F. for Lady Anne Frescheville, on the front cover under a coronet stamped in gold. 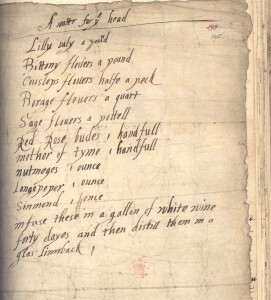 Inside an index to cakes, sweetmeats, waters, perfumes and “phisicall” receipts is neatly presented with the recipes following in beautiful, consistent penmanship throughout, most likely the work of a scribe. Written in many hands of the Fiske family during the 1800s, the second recipe book cannot visually compare to Lady Frescheville’s. However, its cracked binding and numerous stains are evidence of the volume being used and consulted over a long period of time. Recipes for foods, cures, and cleaning household items are arranged into categories, and newspaper clippings of recipes and verses are glued to the inside front and back boards. Most interesting are the pages with rules on setting tea and dinner tables with accompanying diagrams offering us a glimpse into 19th century food presentation and etiquette. Winterthur Library, Doc. 723. Fiske Family Cookbook. We are an international collective with a broad international readership. Can we access any of your items online? People can search for recipe books in WinterCat, our online catalog using such keywords as “cookbook,” “recipe book,” and “receipt book.” However, none have been digitized although I hope to do so in the future. Besides trade catalogs accessible through the Internet Archive, certain manuscript and ephemera material is available online in our Digital Collections. Several thousand loose trade cards are in the Advertising Ephemera Collection and over 100 bills in the Manuscript Invoices Collection. Keep checking back as I continue to add items. If anyone is searching a particular recipe, please contact me at jsolensky@winterthur.org for I have an in-house database of manuscript recipes. I look forward to hearing from your readers and thank you for this opportunity to promote the Winterthur Library’s resources. Now that you’ve piqued the interest of our blog readers, I’m assuming some may want to visit your collections. Could you tell us a bit about the available research fellowships? Winterthur does offer short and long-term residential fellowships for topics of social and cultural history, art and architectural history, decorative arts and design, and the history of everyday life using both museum and library collections. Very timely question, as the deadline for application is January 15. The Winterthur Library is open Monday-Friday 8:30-4:30pm. For more information, visit their website or email them at Reference@winterthur.org. If you would like to nominate a library to be featured in the First Monday Library Chat, please contact Michelle DiMeo.